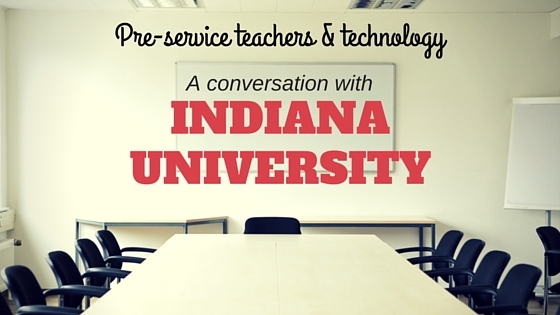 Earlier this week I had the opportunity to speak to a class of pre-service teachers from Indiana University courtesy of Mike Karlin over at the EdTech Roundup. We met via Google Hangouts to have a discussion on the role of technology coaches, tech skills for future teachers, and working with students in a digital age. I thought I would share some of the conversation with the readers of this site with the hopes that you would chime in with your own ideas on each of the talking points. Role of technology coaches – In my opinion, the need for this position within a school district is at a all time high. Access to information continues to be more accessible every day. Use of technology tools has become a staple of a modern classroom. School districts nationwide are moving in the direction of 1:1 computing. All of this means classrooms filled with devices and students expecting to use them. A technology integrationist can work with teachers in groups or individually to help them determine the best method to use that technology in a meaningful way. In some cases, the coach may even model the lesson for a teacher to help ease the initial fears. Technology is an amazing resource for teachers to personalize learning and engage students in new ways. Without a champion to help lead technology integration, the district runs a significant risk that tech will be vastly under utilized among both staff and students. Technology skills for future teachers – The world of educational technology is constantly changing. Don’t believe me? Google any of these terms with the phrase “in education” at the end: alphasmarts, palm pilots, thin clients, netbooks (yuck), etc. All of these were once the hot topic in education and they have all been pushed aside for newer tech. I’m sure future teachers will look back at the Chromebook or the iPad with the same discontent in the years to come. The point of this mini history lesson is that there is no silver bullet in educational technology. Technology is another tool in your toolbox to teach the curriculum with. The medium and device will continue to evolve. My advice is to embrace new technologies, especially the ones you see your students embracing. In the end, its all about staying relevant with the students. When you hear high school students raving about the latest app, take some time to figure out a way to incorporate that app into your teaching. Its not always about being innovative either. You don’t need to reinvent the wheel. Look to Google, TeacherTube, and sites like this one for ideas. Working with students in a digital age – Many of the students in today’s schools have grown up never knowing a world without Google, Facebook, and Twitter. Smart phones and wireless internet have been a common thread for students up through 3rd grade or so. Teacher’s cannot use the excuse of “I’m just not good with computers” anymore. Since the conversation earlier this week was with pre-service teachers, we talked a lot about embracing technology. Similar to the points above, it comes down to an issue of staying relevant with students. Don’t misunderstand my view though. I’m not suggesting that every single lesson needs to be done online using a multitude of devices. What I am saying is that technology provides teachers new opportunities and methods for teaching. Flipping your classroom is a perfect example of this. Flipping is a fantastic way to use technology in a meaningful, purposeful way. I’d love to hear your thoughts on this? What advice would you have? What did I miss on these three topics? Use the comments section below to start a dialogue on this.